Villa Picasso is a world class luxury hotel offering elegance and class. It is located at No. 22 Gana Street, Opposite the Transcorp Hilton Hotel, Maitama, Abuja. The Villa Picasso is 36 minutes away from the Nnamdi Azikiwe International Airport and 4.2km away from the National Assembly. “The Villa” as it is popularly known houses three categories of luxuriously furnished rooms - The Standard room, Executive and Deluxe room. 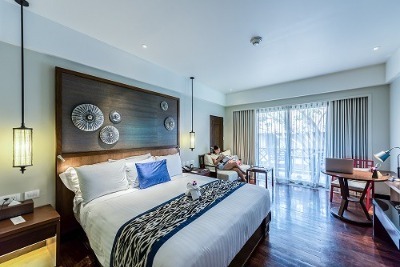 Each room is fully furnished and air-conditioned to guarantee maximum satisfaction. Other features include cable TV, tea facility, comfortable beddings, telephone and en-suite bathrooms fitted with showers and bathtubs. The Deluxe room has a balcony and extra grandeur. Each room has a key-card door lock. Guests at the Villa Picasso are entreated to a complimentary breakfast throughout their stay. Facilities available to guests at Villa Picasso (Abuja) are: a restaurant and bar, swimming pool, Wi-Fi, a gym, a terrace lounge, sauna and on-site parking where maximum security is guaranteed. Additional services include: Airport Shuttle, Safety Deposit Boxes, Business Centre, Car Hire, Daily Newspaper, Room Service, Ironing, Event facilities, Storage room, Concierge and Business centre services. All these are available at a surcharge. Valet parking is also available. Children: below the age of 12 stays for free. Q: Does Villa Picasso have a swimming pool? A: Yes, there is an outdoor pool with recliner seats where guests can also enjoy cocktails. Q: Does Villa Picasso offer free Wi-Fi? A: Villa Picasso offers free Wi-Fi to all checked-in guests. Q: Does Villa Picasso Hotel offer complimentary breakfast? A: Yes, all guests can have this throughout their stay. Q: Does Villa Picasso allow free parking? A: Yes, adequate on-site parking is provided and also free. Q: Does Villa Picasso offer airport pickup services? A: Yes, this is available on request. Villa Picasso (Abuja) is a top-class hotel in Maitama, Abuja. My stay at the hotel was fantastic, I received a warm reception from their ever smiling staff at the reception. My room was beautiful, clean and comfortable. The bathroom was neat, toiletries, toothpaste were all provided, the power supply and water supply were constant. Their staff were respectful and dutiful. I am highly impressed with the services. My stay at the hotel was okay, everything went well apart from the fact that the toiletries were not enough. The staff are good and efficient, so is their service, they have a clean environment also. Have nice pictures of Villa Picasso (Abuja)?